Public Domain is an ongoing project where we make more public already public documents that are important to today’s conversations by exploring archives everywhere. In 1955, twenty-nine African and Asian nations gathered in Bandung, Indonesia to discuss a future non-aligned to the West, independence, and nuclear threat. 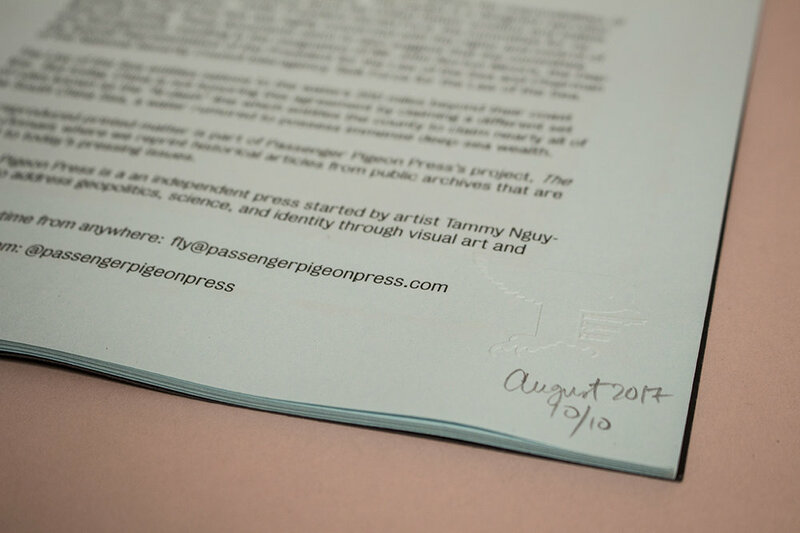 Over the summer, Passenger Pigeon Press visiting the National Archives in College Park, Maryland to look at the eight boxes of declassified CIA documents about this historic Bandung Conference and the subsequent Non-Alignment Conferences. 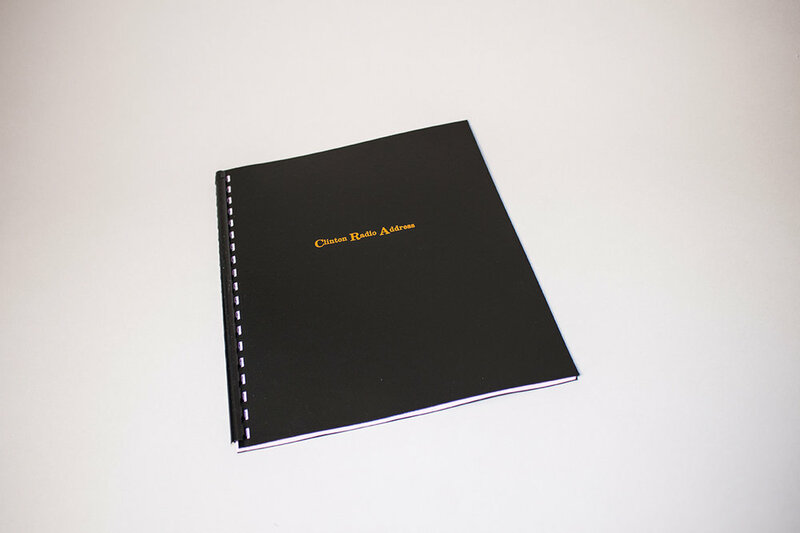 This booklet contains iPhone photos of the entire booklet called Developments Relating to the Bandung Conference and includes analysis and brief biographies of the conference attendees. The comic on the cover was a newspaper clipping also included in the CIA documents. The National Archive Identifier number is: 596572. Today is May 29th, 2018. Since May 3rd, 27 days ago, Mt. Kilauea on the island of Hawaii has growled and roared a spewing, spectacular system of riverways of glowing molten lava. In a picture from NASA, Mt. Kilauea appears like a singular beacon of life amidst a dark planet. I saw another picture where the lava and the earth blended into what looked like a ribbon made of feathers. Like an unraveling lizard’s tongue, the many streams of fire casually swallow the homes in their pathway. Mt. Kilauea has been the origin of Hawaiian myths and a site for scientific inquiry for a very long time. 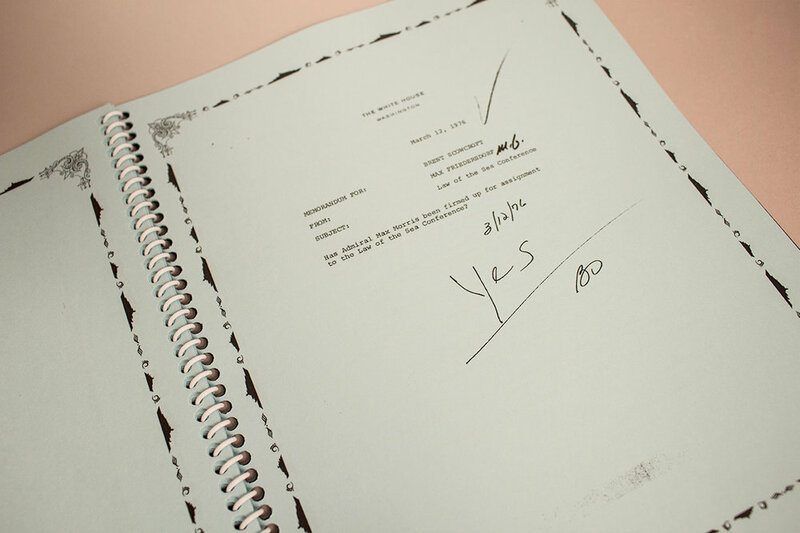 This packet includes an inventory form from the United States Department of the Interior which details an account from 1974 when the summit crater of Mt. Kilauea collapsed, and contextualizes the historical significance of this epic volcano. Passenger Pigeon Press found this article in the US National Archives and it feels timely to share it with the public in this artistic format. This is part of our larger project, Public Domain, wherein we print publicly available documents that are relevant to today’s international politics. This is nuclear drama, a significant part of nuclear policy. The theater of these verbal exchanges is a way of orienting one nation’s power over another. In Ward Wilson’s paper The Myth of Nuclear Deterrence, he states: “Nuclear deterrence, however, is based on an unexamined notion: the belief that the threat to destroy cities provides decisive leverage.” While conventional opinion might consider this effective because it “worked” throughout the Cold War, it is nonetheless a dubious geopolitical tactic. In 1973, the CIA published the contents of this booklet called Soviet Doctrine: Concepts of Intercontinental and Theater War. It is a detailed account of US analysis of Soviet military behavior as well as a detailed list of what the US is unsure of. What is further intriguing about this document is the logic of US intelligence, namely how the CIA poses questions and what answers those questions receive, as described in the text. Passenger Pigeon Press found this article in the US National Archives and it seems timely to share it with the public in this artistic format. This is part of our larger project called Public Domain, where we print publicly available documents which are relevant to today’s international politics. It is going to print now; it is still Thursday, May 24, but the afternoon: 2:13 pm. 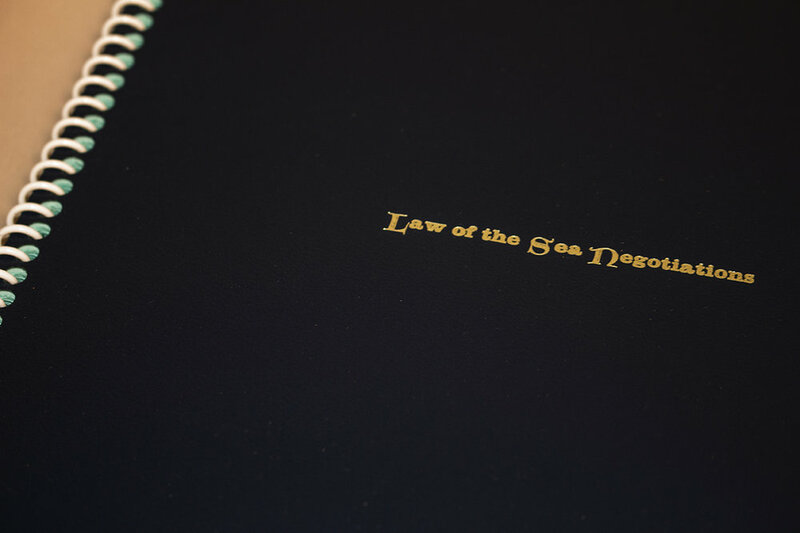 The Law of the Sea is an international treaty which defines the responsibilities of nations on how to use the world’s oceans. 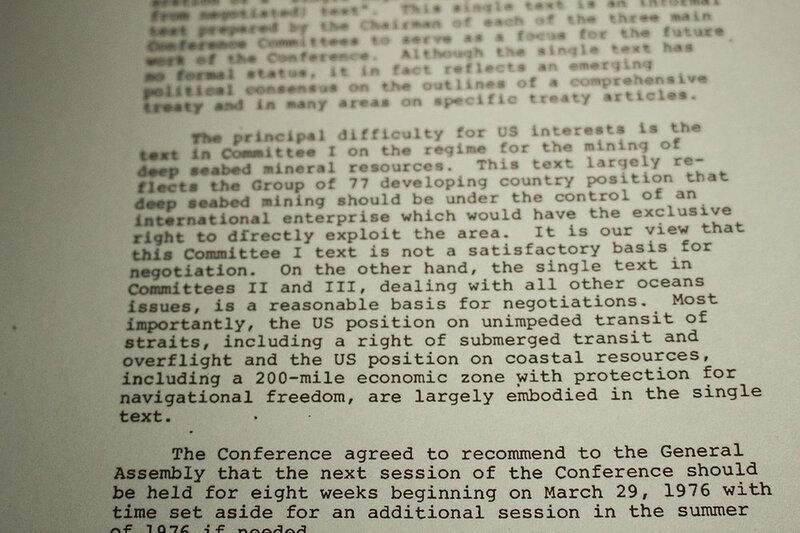 This packet is a designed reproduction on some informal discussions about the United States’ position and stakes during the negotiations. Under President Gerald Ford, the committee for negotiating the Law of the Sea was highly concerned with the rights and control of deep-sea mining. 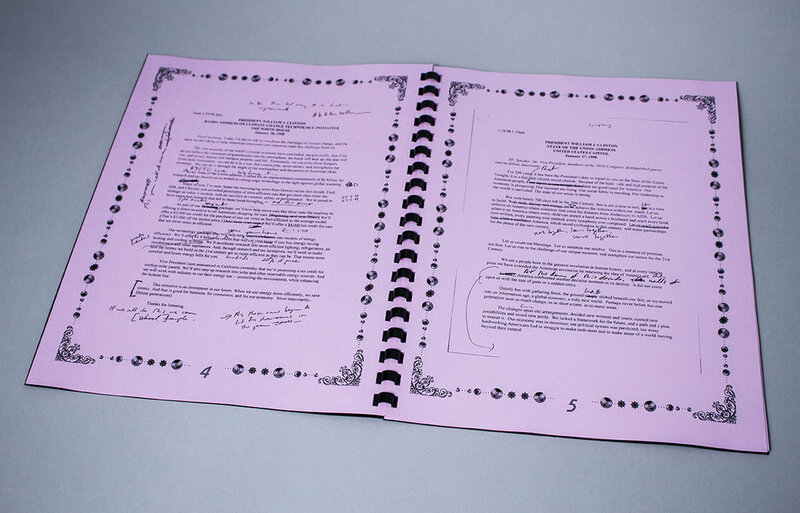 These documents seem to also suggest that the committee was disorganized, resulting in the resignation of Mr. John Norton Moore, the Deputy Special Representative of the President for the Law of the Sea and Chairman of the National Security Council Interagency Task Force for the Law of the Sea. The Law of the Sea entitles nations to the waters 200 miles beyond their coast line. But today, China is not honoring this agreement by claiming a different set of rules known as the “N-dash” line which entitles the county to claim nearly all of the South China Sea, a water rumored to possess immense deep-sea wealth. On June 1, 2017, President Trump withdrew from the Paris Agreement— a non-binding agreement between parties across the planet to do their part in mitigating global warming. This packet is a designed reproduction of a marked draft of President Clinton’s radio address in 1998 on global warming and its urgency. 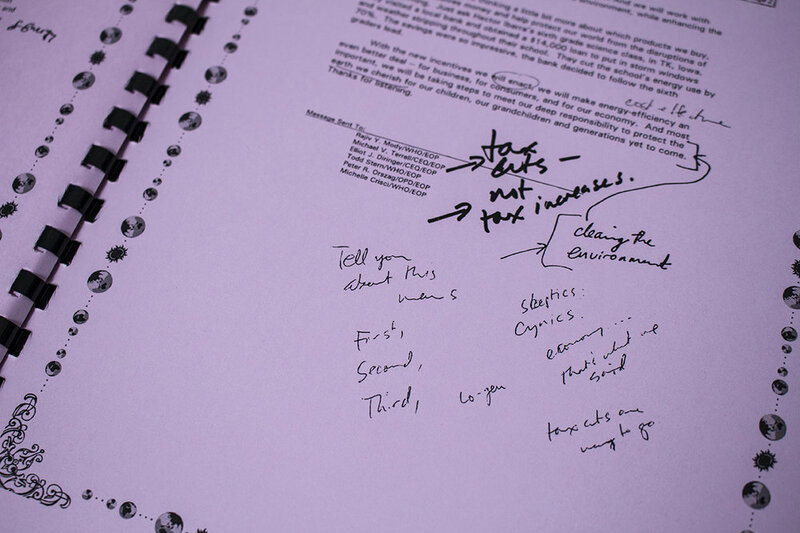 Many of the notes suggest language alternations that more clearly connect climate change to economic necessity.